Nevertheless, safety is an important consideration to make, especially if you wander on trails that take you far from civilization and potential rescue. 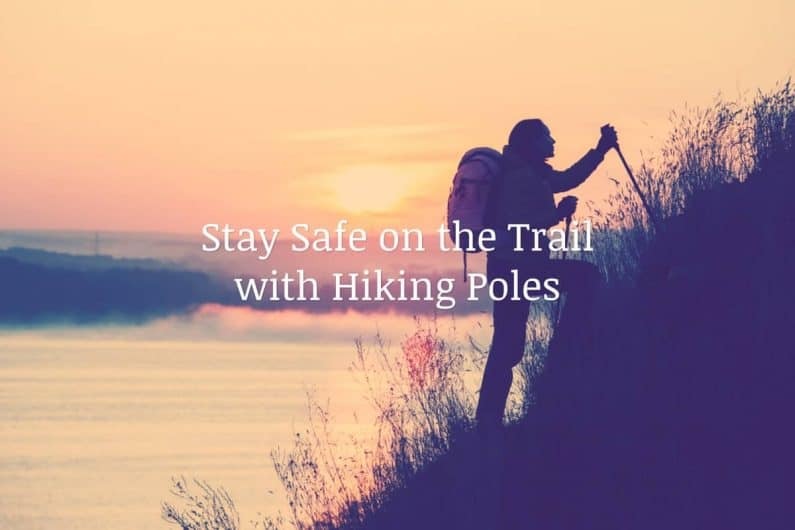 Hiking poles not only increase your speed and comfort on the trail, but also your safety. What Are Trekking Poles For? As you already know, trekking poles are mainly used for walking. However, that isn’t the real question here. You are probably wondering why you would need such a tool to help you perform a task as simple as moving around at a moderate pace. If you’re interested in finding out more about the benefits of this unusual contraption, we will provide you with all the necessary info. That said, there are some concerns about using trekking poles, mainly concerning the environment. There are many reasons why trekking poles are so useful, and in the next few sections, we will discuss them in detail. Many hikers prefer using something to support them while they traverse their paths. This practice has been around ever since humankind stopped using four legs for walking. Our ancestors quickly discovered that using sticks for supporting their weight while walking will take some pressure off their muscles and allow them to put more miles under their feet with the objective of discovering territory and gathering resources. 1. Hiking poles act as antennas. That rock might look stable, but you won’t know until you put your foot on it. Hiking poles can allow you to test surfaces before transferring your full weight. Use hiking poles to probe the ground for slippery ice patches, rogue holes and loose rocks. This is a good way to avoid falling down or twisting an ankle. 2. Hiking poles prevent stress injuries by reducing strain on your feet and knees. As anyone who’s hiked in steep ranges such as the Alps can tell you, mountain terrain can really wear on your legs. Repetitive stress injuries are common among long-distance hikers, so it’s important to take preventative measures. The benefit of using trekking poles for walking is providing additional support to your muscles. This will allow you to traverse longer distances with less pressure being applied to your legs, back and, most importantly, spine. 3. Hiking poles keep you alert. If you don’t believe this one, try doing an algebra problem after walking for a few hours with a heavy pack. The discomfort of a heavy pack tires you out and dulls your senses, making you vulnerable to wrong turns or surprising dangerous animals. Hiking poles will ease the weight of a pack. This will make you more comfortable and therefore more able to be aware of your surroundings. 4. Hiking poles keep you balanced on tricky slopes. No hiker wants to fall to their death; hiking poles are handy on a steep slope that’s intent on pitching you to the bottom. Whether ascending or descending, hiking poles will make slopes much safer, allowing you better control over your balance. Additionally, trekking poles will help you traverse difficult terrains. They can make climbing incredibly easy, especially if you have the fitting endings at the ends of your poles. When going through sand, they will let you keep your stability and not lose much speed. Same goes for walking through mud, water, and other similar types of ground. Poles allow you to have four points of contact, which can help you negotiate patches of loose rocks and slippery mud. While safety is top priority, also consider the other benefits that improve the trail experience. Poles allow you to move faster and cover more ground. If your goal is maximum mileage, poles better be on your equipment list. The use of poles can also make more difficult terrain accessible to older nature lovers. You may be over the hill, but with poles, you can get over a mountain. The essential set of benefits is mainly for people with health issues, such as blood pressure, heart palpitations, and lung capacity deficits. It’s well known that walking can significantly improve these ailments except in the most dangerous of cases. 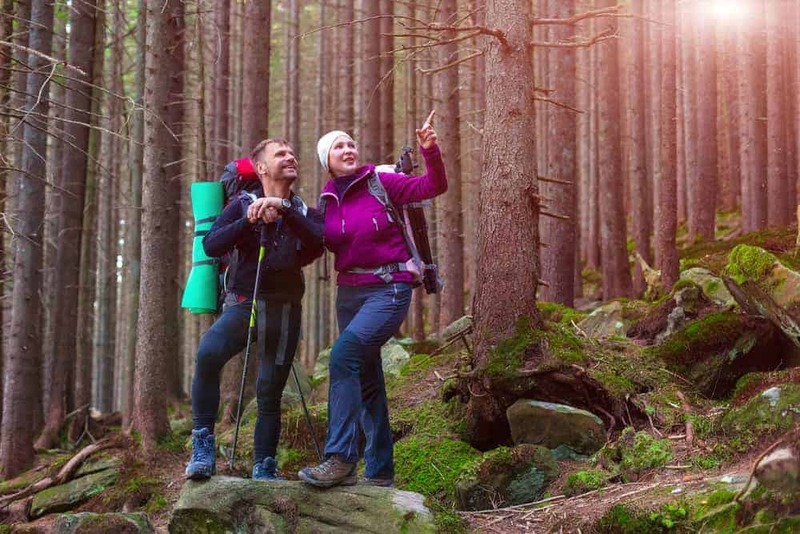 By applying hiking techniques that strengthen your heart muscle, combined with trekking poles, you will improve your heart strength even more than you would by just doing regular walking. This is because trekking poles will allow you to walk for more extended periods at an increased pace. Many poles are listed at $200, but your first set doesn’t need to be that expensive. You can purchase a perfectly reasonable set for $100 or less. If you’re short on cash, simply repurpose some used ski poles, which can often be found for cheaper. To read more about things to consider when buying a trekking pole check out this post [with videos] >>>. Most new trekking poles are made out of aluminum or carbon fiber. These have proven to give you the best balance between durability and price. Also, they are made twofold or threefold so that you can extend or retract them at your own volition. Many have additional design features like ergonomic handles, endings that adapt to different types of terrain, and arm straps to secure your grip better and help you stay in control better. In their core, trekking poles are in no way dangerous for using, no matter how you do it. They can only grant you many health benefits and improve your hiking performance, which is what we talked about earlier. Do note though that some people actually claim that trekking poles are harmful to nature and the environment. They say that careless hikers ruin the boulders and stones by scratching them with their poles. Also, there have been reports of vegetation being damaged by the physical impact of the poles on some of the more popular trails. There is no legal way that anyone can stop you from using trekking poles like the rest of the community does. Nevertheless, if you wish to be entirely morally sound, you can employ some techniques that will allow you to travel with a clear conscience. First off, you should use adequate endings for your trekking poles that will ensure you don’t do any damage to the terrain. These are made out of rubber, and they are easily accessible in various retail shops or stores that sell outdoor gear. Likewise, they are quite inexpensive, so you don’t have to worry about this being too hard on your budget. Also, you can choose not to use your trekking poles when you’re approaching stones that can get damaged or when hiking through places where the poles would hit vegetation while you’re walking. Trekking poles have been used since forever, and they have only grown better as the human kind progressed. More features are being added to them every year, while some others tend to be removed. All of this is done with the objective of making them the best possible for helping humans hike. We hope you understand in entirety what are trekking poles for. Additionally, we have provided some more information about the ways you should use them to get the most out of your hikes and walks safely. If you think you could use the benefits they provide, don’t hesitate to purchase a pair.